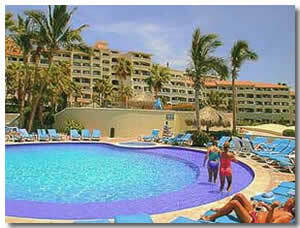 The Hotel Finisterra in Cabo San Lucas is on the more romantic side of Cabo San Lucas. You have a stunning view of the Pacific Ocean one side, and a view of the marina the other side. If you decide on the Hotel Finisterra try and get a room in the new part of the hotel. The older part has had more poor reviews than good ones. This could make or break your vacation. If your choice of room is on the Pacific side you could get some free whale watching treats. Going out to eat will save you some dollars as it does with all the Hotels in Cabo San Lucas. All the bars and restaurants you can visit give you more than enough reasons to venture out at night. You have a choice of three pools to lounge around during the daytime. The lower pool is the coldest of the three but this makes it less popular, and much more peaceful. It's also nearer the beach, and has four relaxing hot tubs. The beach is quiet at the Finisterra Hotel. This is due to it not being safe to swim, but if you want to relax and tan yourself without being bothered by vendors it's perfect. Your stay at the Hotel Finisterra in Cabo San Lucas gives you the best of both worlds. You're next to a peaceful beach, and within walking distance of downtown Cabo. This hotel is more popular for couples on a romantic trip and honeymooners. Just remember to get a room at the new part of the hotel and you will have a vacation to remember.